Following Christ is not easy—it demands your life! If we don’t have a plan for keeping our life on track, we will quickly fall into patterns of laziness or desires that are less than Godly. In this message Josh give five specific ways to ensure we walk in God’s best plan for us each day. If you like these notes, right-click to download and save them! 1. Your busyness is the hallmark of your life. 2. Stress and anxiety are the dominate feelings in your life. 3. Your personal relationships are shallow and sub-par. 4. Your time with God is boring or avoided. 5. You have little generosity and lots of debt. 6. You engage in erratic behavior. Being a dad is the greatest joy of my life. I remember when my first child was born—a son! I was as proud as could be. I think everyday wants a kid to be like them, in some ways. I was absolutely exhausted after the birth of our child, as if I birthed him. But I could not have been more proud. I found a new perspective on life I never had before. Being a dad can be a blast, but it comes with its difficulties. I wanted to take advantage of Father’s day to address men specifically. The culture, and sadly even the church, have minimize the importance of a dad’s role. Sitcoms today make dad out to be the laughing stock. Most cartoons have the dad as a dumb figure, never to be taken serious. Our culture is consistently downplaying the role of the man in the home. Sadly, this is also infecting the church. On any given Sunday there are 13 million more adult women than men in America’s churches. The church doesn’t think of men, cater to men or strive to reach them. I want this to change at Grace. We will be a church when men are valued and like to attend. Does this mean we won’t think of women and children? No! We will reach all people, but ensure that men are welcomed here and have a place where they can grow in their character and in the relationship with God. Over 70 percent of the boys who are being raised in church will abandon it during their teens and twenties. Many of these boys will never return. A church that isn’t thinking of men, won’t reach the culture and will eventually fade away, leaving broken families in its wake. A study from Hartford Seminary found that the presence of involved men was statistically correlated with church growth, health, and harmony. Meanwhile, a lack of male participation is strongly associated with congregational decline. So men—today I’ve packaged today’s message for you, but I believe this is going to be good for you, no matter if you are a man or a woman. The title of today’s message is “The Art of Being a Godly Man” or simply, “The Art of Being Godly.” While the Christian walk does call for great discipline, it is also an art. How to do all that we desire and Jesus desires for us is not easy to figure out. (The promise) Today I want to give you the most practical guide I can give you on how to live a Christ-centered life. We will finish our study on 1 John next week—today, let’s get highly practical and someone topical and address what it means to be a godly man (or woman) today. The teen years: The Apprentice. In this stage you are still learning life from your parents, teachers, coaches and friends. You are taking what is taught and caught and testing and applying it to life, developing worldview and beliefs. The 20’s and 30’s: The Warrior. In this stage you are enjoying the excitement that comes with freedom and exploration. Then you find your spouse, career and home base and begin to refine who you are and what you will do. The 40’s and 50’s: The Influencer. In this stage of life, you are excelling at the life you’ve chosen to live (humbler: reaping the bad decisions you made). You are having influence as you raise your kids, are in more senior level positions at your job and are living out your passions spiritually, politically and recreationally. The 60’s and beyond: The Sage. In this stage, you are now the older or one of the oldest in the room. You have a lot of life behind you—good and bad. You’ve gained wisdom through experience and can impart it intentionally. The fact we must face is that as we grow older, physically and spiritually, we have to face our weaknesses and maximize our strengths. We know where we fall into sin or failure often and we know where we can excel. There will be a point of all of us when we decide if we are going to fight to win or simply survive. In your younger years you had vigor or desire to have an impact. As life handed you hard times, you then had to either chose to work through them or give up. Your busyness is the hallmark of your life. You wake up tired, you can’t seem to get us early enough to get a start of the day. You slam down coffee, no time for breakfast or more than a granola bar. You are out the door onto what feels like the treadmill of life. You’re behind in everything. No time for lunch, barely enough time for the bathroom. Back to home, only to be preoccupied and edgy because you didn’t get everything done that needed to get done. You family gets 60% of you, at best and you count the minutes until the kids are down so you can get back to work. You’re time with God is nonexistent, but you just hope He’ll understand. You fall asleep for the few hours you can, only to wake up again and be just as rush again. Sound familiar? When people ask how you are, instead of saying “Good” you say busy. There is no prioritization of the things your life because you are just responding to other people demands on you. Busyness is not only the best way to describe your life, it is the best way to describe how you find your value. Somewhere along the line it moved from what you did to who you are. Stress and anxiety are the dominate feelings in your life. Peace is more rare than worry. You are always concerned about something. You may have your moments of peace where you forget about the stress for a bit, but the second someone says something that triggers an area of worry for you, a cuss word crosses your mind (maybe even your tongue) and you begin to be preoccupied by that thing. You’ve tried prescriptions, counseling, alcohol or even sinful escapes but the stress comes back. Without certain pills or pleasures you are sure you would implode under the stress. Perhaps your blood pleasure is high, your health is a mess and you know that something drastic has to be done because you can’t live the rest of your life this way. Your personal relationships are shallow and sub-par. Your life feels lonely, and though you have lots of “Friends” or acquaintances, you don’t have any deep relationships to mention. Your relationship with your wife (or spouse) is more of a business partner than a lover. Your time with others is out of obligation, not an overflow of love. Your kids know the “Apple” symbol on the back of your phone more than they know your face. There is nothing innately spiritual coming out of your mouth. When you talk, it is mostly about you, your busyness or what you are preoccupied by. Your posture with others is one of two things: (1) you talk about you and only you, as if you are splashing in the pool if life grasping for air, attention or both. Or (2) you pull away—you are reclusive in your relationships because you can’t handle anything else emotionally. Showing care would cripple you under your already burdened life. You are thinking about other things and don’t have any brain space to think about others. Your time with God is boring or avoided. You can’t remember the last time you had a legitimate quiet time. Or if you do remember, it is because you enjoyed it, you have longed to get back to it and feel guilty that hasn’t happened. You wake up, after hitting snooze through the time you said you’d get up to be with God, just hoping he will understand. You lay in bed at night saying, “God, I am sorry we didn’t really talk today… but I know you see everything and understand.” You don’t spend time with him, or when you do, through prayer or Bible reading, it is quick, all about you and you barely let him speak. You have little generosity and a lot of debt. You don’t give, or rarely give to others financially. You don’t tithe to the church, God’s grater mission—but you hope that God will understand. He knows the obligations you have, so you promise that someday you will be generous, but there is just no way right now. Maybe you sponsor a kid or support a friend’s mission trip or mission effort, but beyond that your money is yours and you don’t have enough of it as is. He’s saying you work so hard for you, not bringing anything to my Temple and you’re doing it all for not. I believe God is saying, there is a connection between your spiritual health and your bank account. Until you start giving to me generously, I will put a “hole in your bank account” to get your attention. This isn’t about you! Your life and all that is in it is mine! Steward it wisely. You engage in erratic behavior. Does a fly have much impact? No, their just annoying, but they are also erratic. They never fly in a straight line, they have identity issues, they often follow the crowd, they wreck good food when they land in it and their preferred time is spent on the rubbish that comes out of the backside of a dog. A person with loss of impact isn’t a lot different—erratic, unfocused, easily distracted, and spending their time on God-knows-what. I know what you are thinking right about now: wow, this is a downer sermon. Maybe we should have stayed home and weeded the garden or cleaned the toilets—that certainly would have felt better than this. I know, while these truths sting, they also remind us that godliness is more than a nice thought: it is a disciplined art form. So let me give you something that I think will help you. While these are pretty high-level, they can be personally and practically applied if you listen carefully. So how do you be a godly (man) person? Frist, you know your Purpose. This is where most people miss it. If you don’t know your purpose, then you will not be able to align everything else in your life accordingly. If you know Jesus, you have the fundamental purpose of Love the Lord your God with all your heart, soul and strength (Deut 6:4-7). But what is your specific call? How has your life experiences and your unique passions equip you to do what only you can do? Psalm 138:8 says, “The LORD will fulfill his purpose for me; your steadfast love, O LORD, endures forever. Do not forsake the work of your hands.” The psalmist is confident that God will do what He intended to do. Some of you think that you’re impact and purpose is all up to you—hence the busyness and the stress. But what if you changed your perspective and you relied on God’s purpose and His fulfillment of it in your life? Here’s a simple way to find God’s unique purpose for you: Pray—Past—Passion—Practice. First you pray and ask God to be with you and clarify His purpose for you. Second, you look at your past, all the way back, and you see what unique things God has woven into your story that make you who you are. Then you look at your current passions, skills, drivers and identify what is special about those. Once you have identified them, you state your purpose (prayerfully) and then practice it. I actually had a friend sit with me for a day and work through this (perhaps you need that, and I can get you some help) and we really prayed and inventoried my life. We came up with this statement: I exist to lead, inspire and motivate people by communicating God’s truth. Once that was clear, I had to go live with, practice it and prove it to be true, all while relying on God to fulfill that unique purpose in me. Then, I had to do the second most important thing as it relates to being godly and that is, keep [my] Priorities. Let’s be honest, this is down right hard, but if we don’t do it we engage in the erratic and self-centered behavior I mentioned before. The Bible makes it clear that we are to have priorities, with God being the first. Matthew 6:33 says, “But seek first the kingdom of God and his righteousness, and all these things will be added to you.” That is a command with a promise—seek god FIRST and all the righteousness of Christ will be added to us! FIRST, not 2nd or 2nd to last, FIRST. Now I want to dispel a myth related to priorities. We often think that if I keep priorities, everything is in perfect balance. That is not true. To strive for a balanced life is a misconception of priorities. Jesus Himself had priorities, but they were not always in perfect balance. At times, His priority of prayer got way more time and attention than His priority of teaching. Other times, His priority of teaching far outweighed His priority of healing (take the Lazareth story for example). The power of priorities is that you know what is most important in your life so you can eliminate what is not. It tells you what to say no to and what to say yes to. Though they may not always be in perfect balance, you tend to them regularly and never neglect them. From your values, you will birth boundaries that keep your life in the power of Christ. For example, in my life Family is my number two priority. From it I have created what I call “Guards” to keep me from going off track. I will not spend more than two nights away from my home a week. I will ensure I will make sure I have one true day of rest every week. Those are examples of priority breeding principles, which leads me to the next application for keeping the art of godliness, and that is to Live by your Principles. Principles are the values or ethics that drive your daily decisions. Most people are not principled people, they are emotional people. We make decisions on what feels right, not always what is right. Living by your principles means that you will value accountability and discipline. You do what you say you are doing to do, no matter the pressure. Let me be honest—I would much rather do what feels right all the time then what is right. That is just the human nature. We like what feels good. I don’t always want to get up and go to work. There are times I’d rather eat a donut then run on the treadmill. Some mornings, I’d rather watch the Today Show than read the Bible. But disciple—or principle living—means we make intentional decisions to do what we said we would do, even when we don’t feel like it. Hebrews 12:11 says, “For the moment all discipline seems painful rather than pleasant, but later it yields the peaceful fruit of righteousness to those who have been trained by it.” Amen. I for sure agree with the first part, but believe the second. If you truly believe that the fruit of righteousness will come in your life if you stay to your principles and allow God to live out His purpose in your life, then you will be continually reliant on the Holy Spirit to lead you and guide you. You will Commit everything to Prayer. 1 Thessalonians 5:17 says three words, “Pray without ceasing.” Not, pray when you feel like it. Or “Pray in a crisis” but “Never stop praying.” Just like we never stop thinking, so we also should never stop praying. 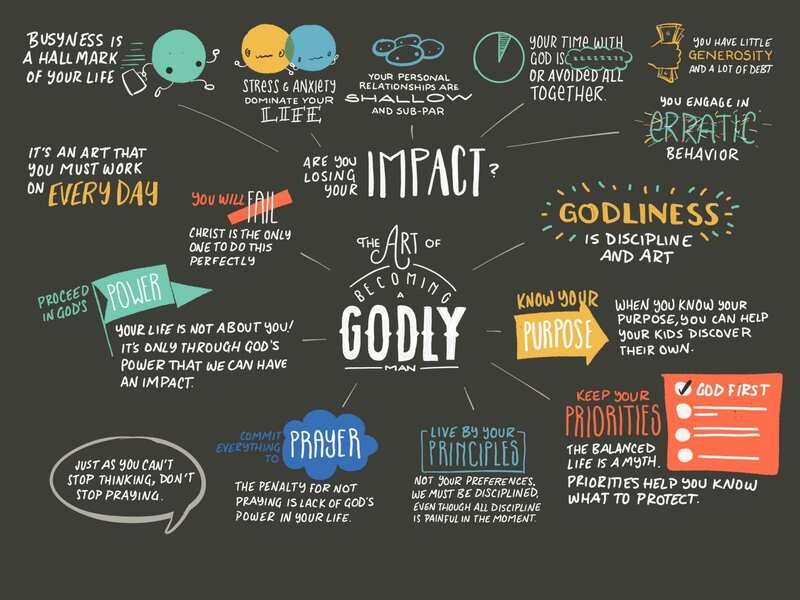 This is not a forth suggestion or task, it is the thread in all of these elements of impact for it is only by prayer and dependence on God that we can have impact. The penalty of not praying is to lose the power of God. No. Rather, and finally, to have your greatest impact you want to Proceed in His Power. Let me say this clearly again—your life isn’t about you. If you are going to have any lasting impact as a father, friend, son, husband, single-guy, business man, leader or church member, you must rely on the power of God in you. As Paul was talking about putting on the armor of God so we can get in the game of life, spiritually and win it, he wrote in Ephesians 6:10, “Finally, be strong in the Lord and in the strength of his might.” Not strong in YOUR might, but in HIS. priciples, (4) commit everything to prayer and (5) proceed in God’s power.